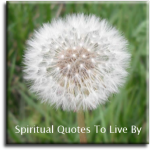 Abraham Law of Attraction quotes are all inspirational words from Esther Hicks, speaking the words of Abraham. Giving Law of Attraction guidance since the 1980's Esther and Jerry Hicks are considered by many (including me) to be the ultimate teachers on the understanding and usage of this natural law. Let go of control and chill out...Let it be, trust. Describe it until it moves you emotionally and then the universe has to deliver it to you! Desire and belief: those are the components that are necessary for anything that you want to achieve. Every time someone ‘tries’ they go upstream. I am the conjurer of my own mood. I am the keeper of my own attitude. To help me in the deliberateness of my creative endeavour. If you intend to be of assistance, your eye is not upon the trouble but upon the assistance, and that is quite different. When you are looking for a solution, you are feeling positive emotion, but when you are looking at a problem, you are feeling negative emotion. If your desire is strong enough, it doesn’t matter what your beliefs are. If you have a desire that is strong enough, that desire will be the dominant vibration, and it will over-ride any other vibration you have. It is as easy to create a castle as a button. It’s just a matter of whether you’re focused on a castle or a button. It's not about action... It's about vibrational alignment. It's not your work to make anything happen. It's your work to dream it and let it happen. 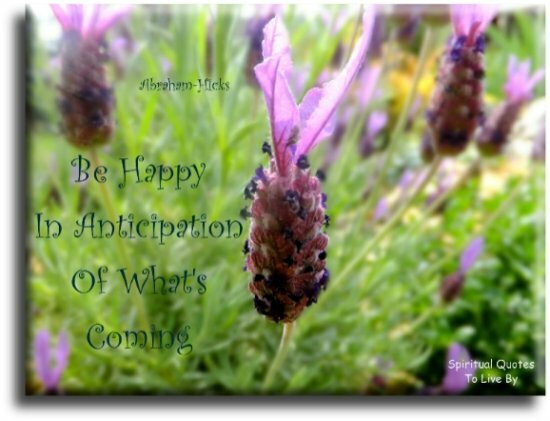 Law of Attraction will make it happen. In your joy, you create something and then you maintain your vibrational harmony with it, and the Universe must find a way to bring it about. Light your light, and let the things that match you, come to you. Offer a vibration that matches your desire, rather than offering a vibration that keeps matching what is. Reality does not mean diddly-squat, reality is only a temporary reflection of a habit of vibration that you have the power to change if you will stop focusing on the condition that doesn’t let you change the vibration. The creative process is a three step process. Step one is you must ask for what you want, you do not need to use words to ask, in fact the Universe is not even hearing words from you, the Universe is responding completely to your vibration. The second step is answer, an answer to what you are asking, and that is not your work in your physical form. The Universe will do that step for you, all of the Universal forces are responding to the thoughts that you have set into motion. There is another step which you must understand and it is called step three, which is the receiving step, which means you must bring yourself into alignment with what you are asking for. The emotion you feel is always about the vibrational variance between where you want to be and where you are. If you’re out of balance, there are only two ways to bring yourself into alignment: either raise your expectation to match your desire, or lower your desire to match your expectation. There is a Life Stream that flows to you, and this is a Stream of clarity, a Stream of wellness, a Stream of abundance - and in any moment, you are allowing it or not. What someone else does with the Stream, or not, does not have anything to do with how much of it will be left for you. This is a Universe that is based upon attraction. Everything is about attraction. Those old habits don’t have to be erased, they just become replaced by a new habit that is more in vibrational harmony with who you are and what you want. Today no matter where I'm going, no matter what I'm doing, no matter who I'm doing it with, it is my dominant intent to look for and find things that feel good when I see them, when I hear them, when I smell them, when I taste them, when I touch them. It is my dominant intent to solicit from experience and exaggerate and talk about and revel in the best of what I see around me here and now. We’re going to drop a bomb on you: Genetics is thought. Nothing is heredity, it is all thought. Nothing is born unto you through your blood. It is born unto you through your thought. 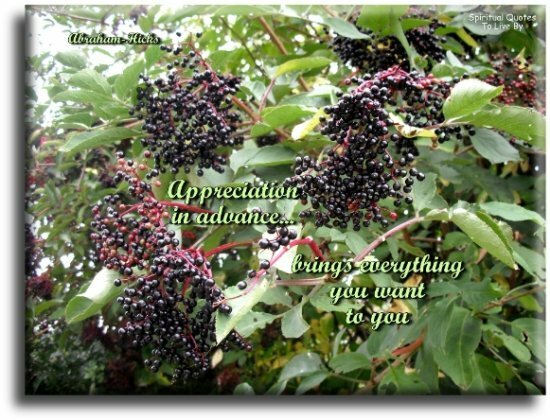 Whatever you are giving your attention to, already has a vibration of its own, and as you give your attention to it, you include its vibration in your vibration...and then your point of attraction is affected. When you ask it is given - but at some point you have to stop asking and start expecting. 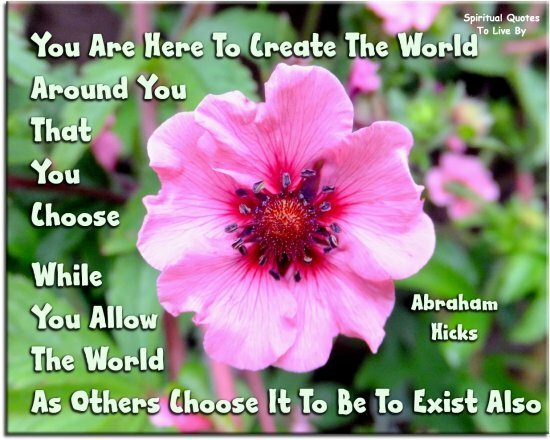 You are here to create the world around you that YOU choose - while you allow the world, as others choose it to be, to exist also. And while their choices in no way hinder your own choices, your attention to what they are choosing does affect your vibration - and therefore your own point of attraction. You don't have to work at being in the high vibration that is natural to you, because it is natural to you. But you do have to stop holding the thoughts that cause you to lower your vibration. It's a matter of no longer giving your attention to things that don't allow your cork to float or don't allow you to vibrate in harmony with who you really are. Your hands are tied in action, but your hands are not tied in imagination and everything springs forth from the imagination. Everything. 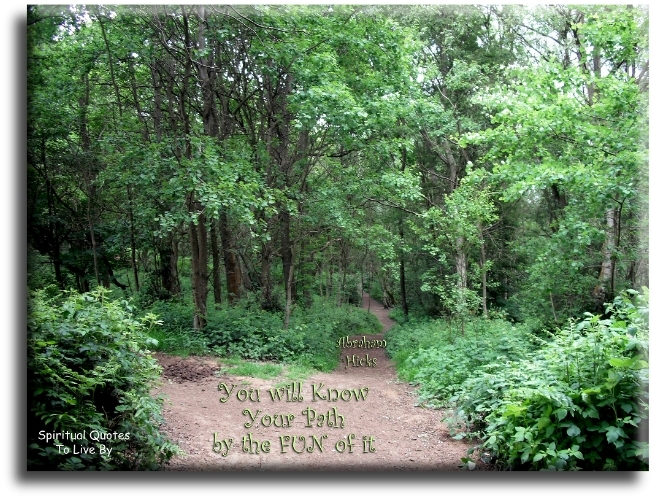 Your path is not narrow...so you can't mess it up. Your Vortex is pregnant with everything you want.